Donald Duck Banned in Sweden? Donald Duck banned? Now that I’ve got you’re attention, let me elucidate. Apparently, Donald Duck was banned in the country of Sweden for being a little to risqué. Or was he? I ran across this great blurb in a 1978 Eyes and Ears cast newsletter. DONALD DUCK. .. AN OUTCAST? As many of you may be aware, Donald Duck literature and films were recently banned from Sweden due to Donald’s “risque” behavior. In light of this banishment, syndicated columnist Mark Russell made the following observations, reprinted from the Sunday, February 26 edition of the Orlando Sentinel Star. Airport authorities are said to have arrested two Americans charged with smuggling Donald Duck comic books into Finland. 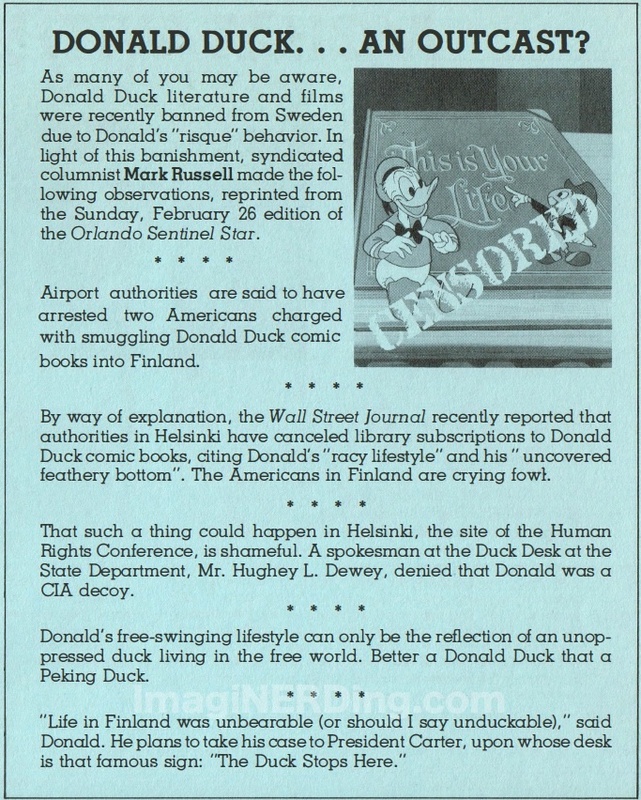 By way of explanation, the Wall Street Journal recently reported that authorities in Helsinki have canceled library subscriptions to Donald Duck comic books, citing Donald’s “racy lifestyle” and his” uncovered feathery bottom”. The Americans in Finland are crying fowl. That such a thing could happen in Helsinki, the site of the Human Rights Conference, is shameful. A spokesman at the Duck Desk at the State Department, Mr. Hughey L. Dewey, denied that Donald was a CIA decoy. Donald’s free-swinging lifestyle can only be the reflection of an unoppressed duck living in the free world. Better a Donald Duck that a Peking Duck. Of course, this was all tongue-in-cheek and was meant more as satire than anything else. Donald Duck banned? Read this article to learn the truth!